The filter list is useful, and so are the extensions. It is easy enough to add the filters to a content blocker or create your own filters using them. Regardless of whether you use the extension or the filter list directly, it is clear that the extension does away with a huge annoyance on today's Internet. 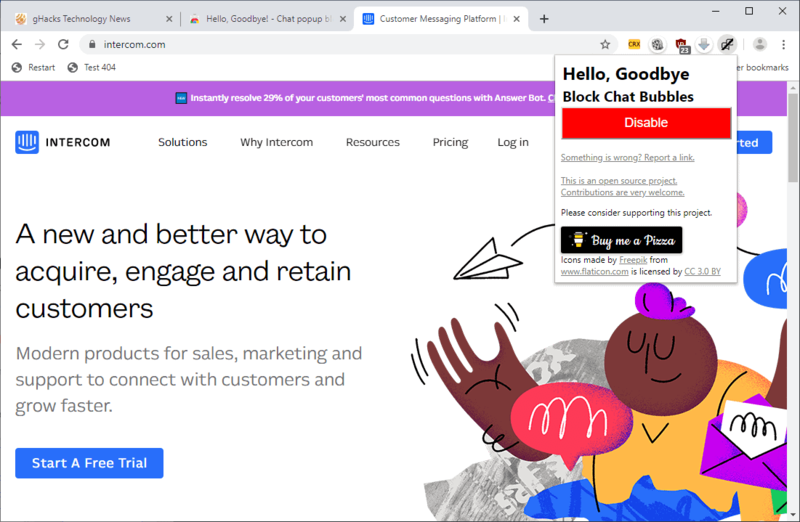 Not all users are exposed to chat or helpdesk bubbles and popups regularly or frequently, and the extension is probably not for them. Those who encounter these regularly however, may want to give it a try. Now You: Which annoyances would you like to block on the Web? Just block it with any regular Adblocker like UBO, ABP or Nano Adblocker lot more easy and one less extension. That’s not a very nice thing to say is it, better the other way around like the Beatles would sing it. It may not be a friendly approach but it’ll be ours when facing helpdesk or chat functionality. Added the dedicated filter list to ‘uBlock Origin’, and considering it holds only 16 filters at this time is enough to spare me tie time of wondering if it’s worth it given I’ve never encountered such disturbing helpdesk or chat functionality on a Website. Move off or it’ll be me. Happens it’s me given the site is unlikely to fire off to hell. So I abandon such places and never return. That bothers me. Speaking about filters and blocking… Here another ‘creative’ way to solve the automatic update of Acrylic Hosts. My knowledge of programming language is limited to “Hello World”, so it is a ‘chimera’ of routines. But compared to Hostman output it seems to be working. @Shiva, thanks for sharing but I’m afraid my programming skills are lower than yours given they’re yet to arise, lol. That UpdateHostsAcrylic is a python script if i’m not mistaking and Python is not installed on my PC. Scripts frighten me generally speaking because of their potential and because I’m a neophyte. I’ll carry on with my old mechanical approach, even if your approach is certainly more pertinent. It is only a series of simple actions on a text file merged after downloaded the lists with Autohotkey file and it has nothing to do with StevenBlackHosts advanced script that is a serious way to programming. But I’ve already changed it. I anticipated you a possible alternative to solve the issue with HostMan\Seqdownload links, don’t touch the Hosts file and update all list automatically. I used Phyton because I already installed it due to OpenWith addon and thanks to missing API in Firefox. The next step is do all the job only with Autohotkey, I still have to write the find\replace actions, but on the basis of the ‘infinite monkeys theorem’ I will get there. Another excellent and useful article.